Quiet, Euphonium! I Want to Hear the Rest. | UEM! The first season of Hibike! put the growing togetherness of Kitauji’s band in parallel to the improvement of their performances. Into the second season too, we see social stability married with musical excellence. Knowing one’s self is paramount to expressing that self through an instrument; knowing each other, and being there to support each other, is essential to being able to play as an ensemble. For thirteen episodes, Hibike! wrapped this all in a narrative that reflected the dynamic: the slow, wistful build of the story matched the lack of focus the band initially had themselves. The intensity of moments later on evoked the band’s own growing motivation and determination to make a scene with their music. But the second season has dressed the story with a new style of narration: the voice of Kumiko, in the past tense, giving readings and interpretations of moments that were once a space for the viewer to explore. Kumiko always had the last word: her motif that ‘the next piece begins’ resounds at the conclusion of every episode, for both seasons. But otherwise, in the first season, she held back. We had none of this future-Kumiko telling the story for us. This isn’t to say a character-narrator, intruding into the action to offer another layer of thinking, can’t be used to great effect. Fincher’s Fight Club feels like Palahniuk’s novel in motion, particularly thanks to a stellar vocal performance both into each scene and out to the viewer from Edward Norton. The vocal cross-cutting between two psychological profiles, the muted insomniac life of the protagonist and his inner jaded cynicism, fit the flow of the story and its own psychotic fluctuations. But it helps that Palahniuk wrote in first person: when a novel is written in third, unraveling any characterized voices woven into the narration – free indirect style – is a nightmare. For Hibike!, the use of multiple voices from Kumiko hasn’t worked as director Tatsuya Ishihara must have hoped it would. As well as Kumiko speaking and Kumiko thinking, we now have a wealth of subjective commentary from a future-Kumiko that takes the heroine’s young voice and fills it with a weight of wisdom and understanding. At least, that’s the intended impression: but the distant musings have done far more to obstruct my immersion than aid it. In the last few episodes, these narratorial additions have grown from curious comments to unnecessary intrusions of the drama and motion of the story. 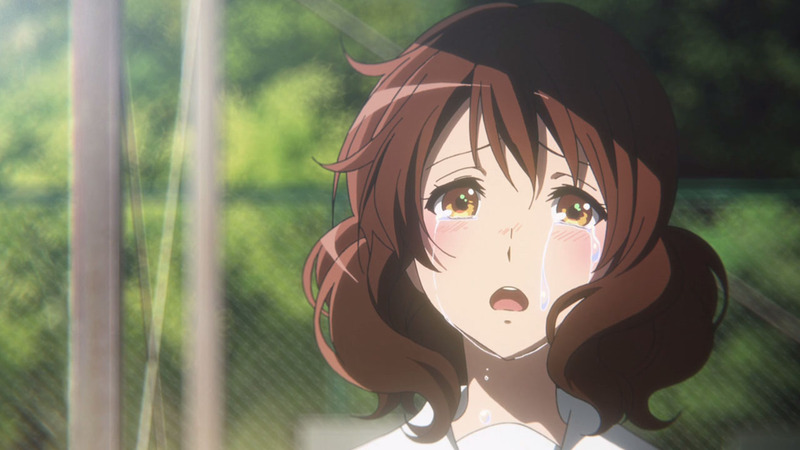 After the scene with Asuka’s mother slapping her and denying her daughter a place in the band, Kumiko tells us that “stories about the incident spread in the blink of an eye”. The relatively dead metaphor and abstract what we just say to ‘the incident’ is laborious enough, but telling us afterward that “the band was immediately shaken up” undoes a lot of what Hibike! has always been masterful at: letting its music and social dynamics inform us of the security and insecurity of these students, and of the band as a whole. We rush through a whole period of destabilization, and it weakens the intensity of the issue. We’re supposed to believe the band is shaken because we’re told, in a story where our suspension of disbelief has always hung on the performance of characters: primary experience of their expressiveness, and not second-hand accounts of a mass migration of feelings. Imagine taking these intrusions out of the story: replace them with some discussion, some imagery, that shows us these developments. A small point of inquiry is all we need. But this isn’t a simple case of ‘show, don’t tell’ – the greater grievance is that the action does show what Kumiko directly tells us. 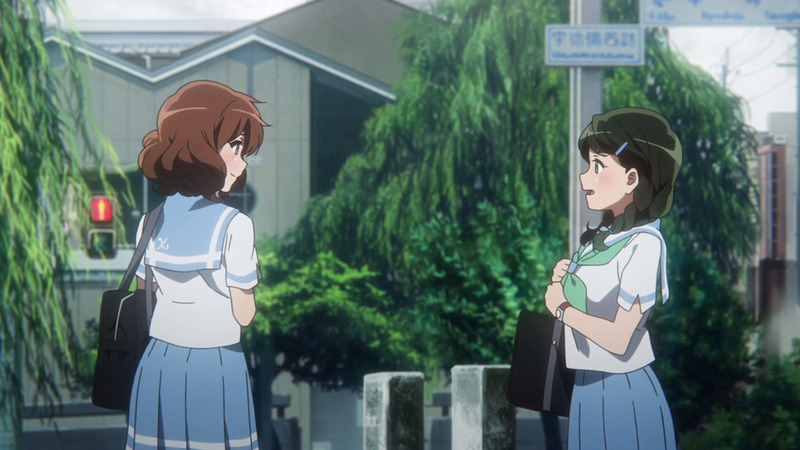 After a conversation with Reina, as Asuka returns, Kumiko again narrates the meaning of the events: she says Asuka came back “as if to scoff at our concerns – as though it were nothing”. Asuka’s return doesn’t need Kumiko to read it for us – we can quickly gather she’s treating things like nothing had happened. We know it’s an integral part of her character to shrug of the responsibility of responding to a sense of narratorial order in her club, and to ‘scoff’ people for taking things seriously; she sidesteps the drama and plays the sly fool to the girls. We’ve been with her for a season and a half, and yet Kumiko’s voice doesn’t trust that we can understand her for ourselves. While the story is focused on Asuka, it’s as though future-Kumiko can’t help but draw it to herself. Pay attention to when future-Kumiko speaks, and this faculty of talking over events becomes alarmingly frequent. Following a fantastic scene of her sister fighting with her parents, future-Kumiko gives us a past-tense account of what’s on present-Kumiko’s mind: her sister’s words and actions. Why do we need this? The flashbacks alone tell us what words, what images, what feelings and memories she can’t get out of her head. In comparison, her row with her sister in her bedroom, with Reina as witness, is so much stronger, particularly because Kumiko’s confidant is not, through omniscient speech, the viewer, but rather her friend on the narrative level. She talks to Reina instead of us, and we slide back into the familiar, constant role of an eavesdropper on natural conversations. We’re not subjected to manufactured evaluations of what’s unfolding before us. When we hear future-Kumiko, we step outside of the story and look down on it; the narratorial distance between ‘story time’ (what happens) and ‘narrative time’ (when it’s told) grows immensely, and placelessly, and the narrative mood of Kumiko’s voice switches from participant to observer. Moreover, the tone attempts to be poetic but often comes out as drab. A meeting with Aoi is closed with her being summarized into a metaphor, ‘ice wrapped in a blanket’. Is the visual imagery and tension not enough – do we really need Kumiko to read this scene for us, and override our own ideas about how to perceive the exchange? I loved it when the drama spoke for itself: after the audition for the solo, in the first season, Kumiko gave nothing more than her anticipatory ‘next piece’ coda. She remained silent, and we could drink in all the meaning of the scene for ourselves. Imagine if she had started reading it for us – imagine her stately narration announcing what this meant for Reina. Imagine a dodgy metaphor here, images synced to what the words describe. No! The beauty of the scene was that the music took center stage. The drama took center stage. Reina took center stage. Meanwhile, in this second season, a heartfelt discussion plays out Asuka and Kumiko’s thoughts and feelings about their love for their instrument. But again Kumiko wants us to leave the scene, right before Asuka begins to play and the feelings between them resonate in melody. 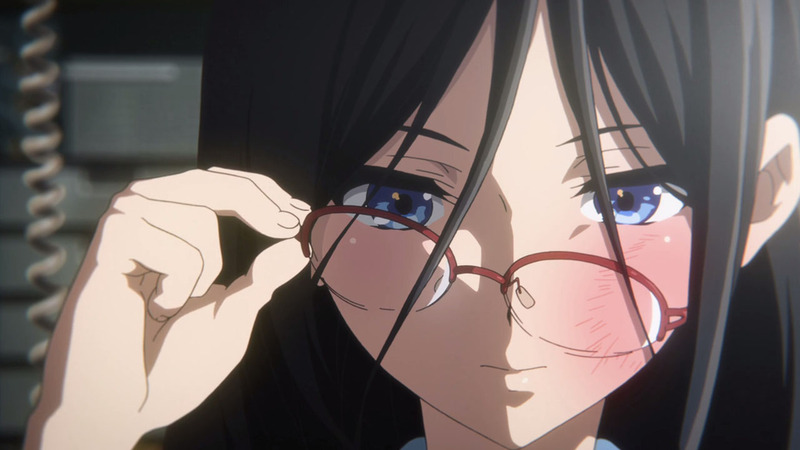 She comments on the uniqueness of her smile – her thought-voice recounts the thoughts of the Kumiko we’re watching. But the feeling of realizing that uniqueness is lost for us, because the smile isn’t ours to decode. That scene discusses what it means to ‘be’ a euphonium. We feel a great sense of Kumiko embodying what the instrument is there for in a band: not to be flashy and play solos, but to be there for everyone else, listening to them and understanding them. With this message laid across the narrative, Kumiko’s narrative style clashes: rather than position us through Kumiko’s deciphering eyes, we hear future-Kumiko wrap everything up for us. Even in a scene already praising her understanding spirit, a scene concentrated on the beautiful music of someone other than herself, future-Kumiko can’t help but fix her own perspective as the central subject of the story: not a subject through her perspective, but the perspective itself. This isn’t focalization: it’s the kind of obtuse solipsism one gets enough of from badly-written self-conscious otaku. At least some things are left for us to fiddle with or drown in as we read them. 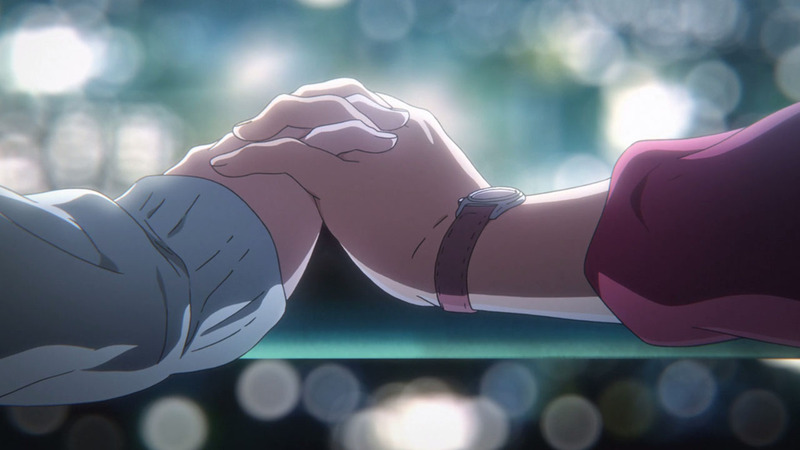 The scene of Asuka’s shoelace being tied: the cinematography and mystery of the relationship dynamics being played out in such a simple scene – what a boon it is that Kumiko’s voice is held back! Likewise, when Reina reads Taki’s photograph and is hit by a revelation – what a relief Kumiko didn’t notice! But when it’s Kumiko contributing to the drama, it’s always a little weaker for me, given her overbearing authority over interpretation in the wider story. I can’t downplay Tomoyo Kurosawa’s stellar performance as our heroine tearfully cries out her heart to Asuka about wanting to play with her, but it feels like future-Kumiko has. 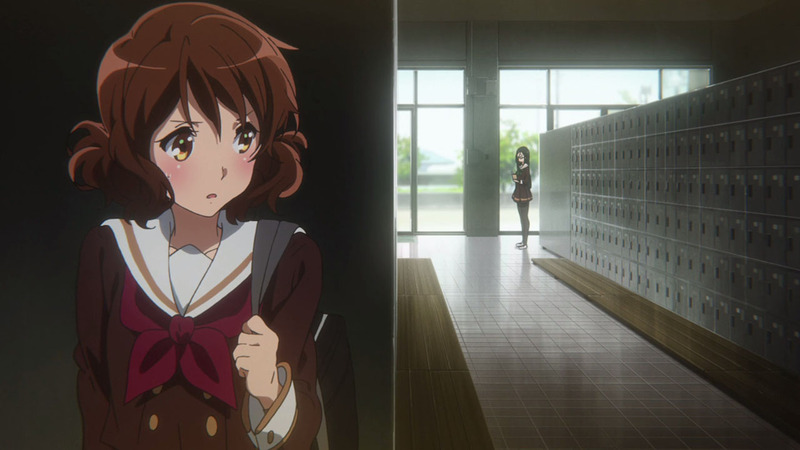 Kumiko’s greatest blow to Asuka is that she’s just another high school student. She’s not ‘special’ in the way everyone likes to talk about her as. It’s the cry of Kumiko problematizing individualism in the arena of collaborative artistic performance, for herself as well as Asuka. Why then have we had our heroine assert her own individualism over the course of so much of the second season’s drama? We’re so often given a privileged position beyond the story as it plays out, and it’s always Kumiko that grants it. Some might say it feeds into what Asuka says of her – that she always stands from a safe distance. But if her overbearing narration was a manifestation of a character flaw, the narrative would address it: yet in the following episode, future-Kumiko remains to take charge. Even the tumult of Reina’s development gets the treatment of narrative summary, the crux of her arc of characterization told by future-Kumiko rather than shown by the story. The cinematographic parallels between their mountain scene and the meeting they held up there in episode 8 are a masterful stroke of signifying development. But when it comes to Reina’s story and her story alone, it’s rushed over by Kumiko. 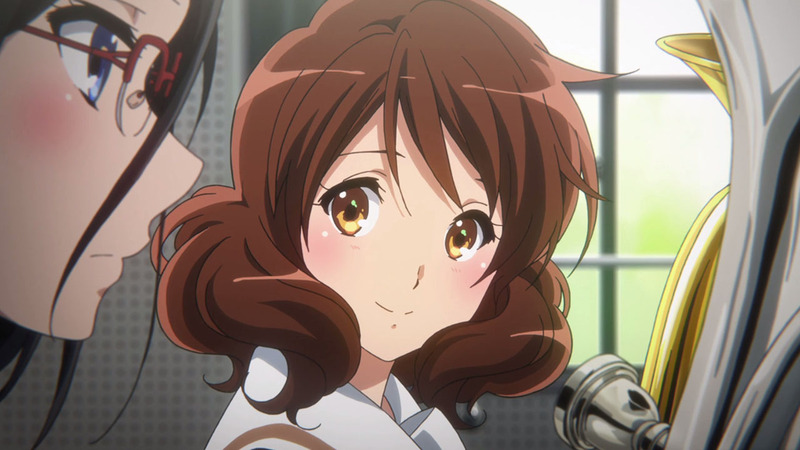 When Kumiko became more secure with her euphonium at the climax of the first season, it was shown through Taki’s confirmation of her ability. No diegesis, no direct ‘I got better’ – we felt it, and we felt like she’d earned it. While Taki’s criticism showed Reina faltering in the second season, it’s Kumiko who summarizes what Reina achieves. It feels like the poor musicianship of a young student who only wants to play the important bits, and rushes and fumbles over the greater swelling of a piece, and over other people’s parts. The mountain scene is incredible, but putting its aftermath on fast-forward takes away from some of the magic those moments created. It is Takeda on autopilot as she figures out what she wants to write about in the third novel. It is also my least favorite book of the whole franchise. The series has switched genres at this point and this is extremely telling when it comes to how the narration and Kumiko’s role work. In the book, she regains her position as the supporting protagonist but feels out of place in the whole situation. This is a book about the problems between her senpai. She has no reason to participate. All she does is eavesdrop. When she does confront people, anything dramatic is told in flashbacks. Important characters in the first book like Reina are relegated to the background. The narration used in the first volume here just doesn’t work. Kumiko just feels irrelevant here. So irrelevant that the protagonist of the second book is someone else and Kumiko is there to be a literal observer and narrator. The dramatic arcs with Yoroizuke Mizore are as compelling as the first book’s — maybe better — but it might have made more sense if she isn’t the narrator in this book. There’s nothing that made her feel like a supporting protagonist here. She’s there because she is the protagonist of the first book. Midori’s real name is Sapphire and the narration constantly calls her that, despite Midori’s insistence that Sapphire is an awful name. So what does this imply? Surely, Kumiko likes her enough to not call her in a demeaning way. But the name, Sapphire, is something that sticks out in her mind a lot. Kumiko probably likes the name and that’s why she refers to Midori as Sapphire in her head. The third-person narration lets us enter her head and examine what she is really thinking. Even if the narration doesn’t say it. The first season couldn’t capture this dynamic in cinematography or narratorial intrusion: it comes out in Kumiko’s speech instead. But it feels like the second season tried to make some of these thought-dives work. The metaphors and summaries out of touch with the tone of Kumiko’s performance in a scene feel displaced because Kumiko herself feels like a wandering singularity of drama rather than a fully-fledged narratorial force. They’re weak because sliding between characterized thinking and cinematographic seeing isn’t as fluid in anime as it is in the free indirect style of Takeda Ayano. Free indirect style creates ambiguity between the voices of character and third person narrative; the constant narrator suddenly, subtly sounds like the person we’re following. In the anime, the ambiguity is lost: we know it’s Kumiko talking and her talking alone, and yet she also sounds like a detached narrator, impersonal and disinterested from the action. It doesn’t work in reverse. 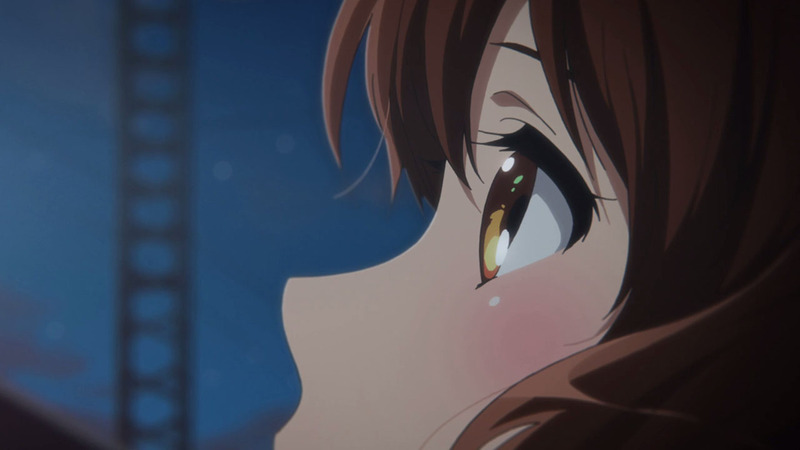 Future-Kumiko isn’t saying what Kumiko would be thinking in these moments: no-one thinks to themselves the girl they were talking to is ‘like ice wrapped in a blanket’. The written word can make limited voices soluble in omniscient speech, but Hibike!’s attempt at replicating this in its second season is more like oil and water. Hibike! doesn’t feel more ‘literary’ with future-Kumiko throwing us metaphors, wise words and poetic redressings of situations. Cinema feels ‘literary’ when camera, voice, acting and art all join together in subtlety and emotionally punctuated thisness, like Kitauji’s band has. Future-Kumiko’s narrative voice doesn’t work with many scenes. It doesn’t add to them – it overrides them, and it overrides us. When it hits your screen, the story belongs to the viewer. The more we feel motivated to engage with it, the more entertaining it gets. Hibike! is at its best when I’ve had a few minutes to sink into a scene, and then the drama goes full throttle, the background art drenches the character dynamics in ideological poise, the animations are fluid, the expressions are delicate, detailed and demonstrative of more than a paragraph in every twitch of the face. 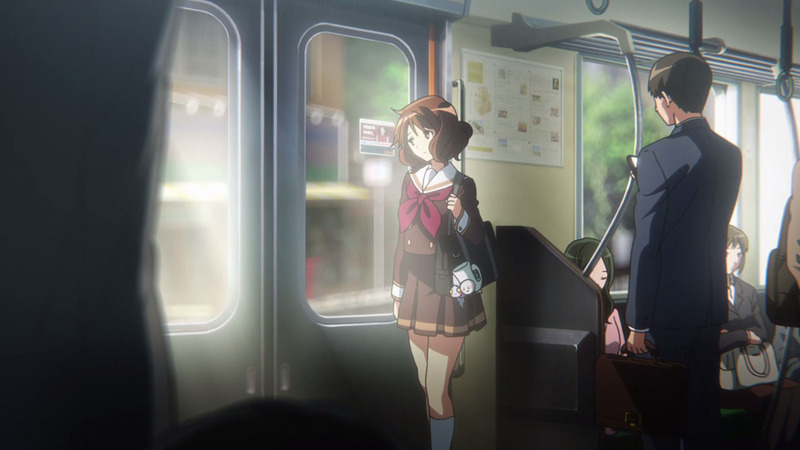 But with Kumiko blaring her euphonium over the rest of the piece, at times she ought to be playing piano, or resting entirely, I can’t help but feel drawn out of the action, again and again. With Kumiko playing like this, Kitauji should fall flat at the Nationals. Hey, thanks for linking my post. But I’m not sure if I’m entirely comfortable with the post being used to criticize the anime script when … I actually think the script is far superior than the books. Hanada Jukki seems to understand the characters more than Ayano Takeda herself. Even in the missteps like S2E11, Hanada is very interested in fleshing out characters’ motivations and making them active. The first book would have been impossible to adapt onto the screen if major changes are made. I think the anime original content makes it worth it. In the second anime season, I actually thought Kumiko was far more active throughout — even in the Mizore/Nozomi arc. Personally, I never liked Kumiko after the first book. But the anime made me empathize with her because of the voice acting as you mentioned and the fact she narrated like this. I don’t know if you can say Kumiko’s narration is the “future”. I’ve always felt she is introspective in the current. There are no hints as to what the future lies to besides the ending shots. And I honestly think the anime does a way better job at adapting third-person narration than the book itself. The book is always at Kumiko’s point-of-view while the anime is okay to jump to other people’s POVs. I was pleasantly surprised alongside fans and even Takeda herself when Shuichi and Mamiko talked during S2E8. That was not in the book whatsoever. Plain anime original content with the least flashiest cinematography. But I really found it quite charming. The same can be said with S2E9: When Kaori ties Asuka’s shoelaces, I am deeply impressed by how tense it is. That never is a thing in the book, which is used to break up the tedium of conversation — something Takeda is not very good at when she is writing the third book. The angles used and even the 180 degree rule break are really something and shows the staff’s eye in storyboarding and layouts. Which is why I have to disagree with what you said about visual storytelling. I don’t mind flashbacks and I don’t mind being “told” via cheesy metaphors. I’ve always found Euphonium to be the most mainstream and cheesiest book series I’ve read in a while. I love the fact that it’s actually dorky and not at all subtle. I love the fact everyone is always the good guys, despite not being at all realistic. And I love the fact that it is an inspiring book no matter what weird crap happens. Kyoto Animation’s staff, especially Yamada Naoko, really captures that. 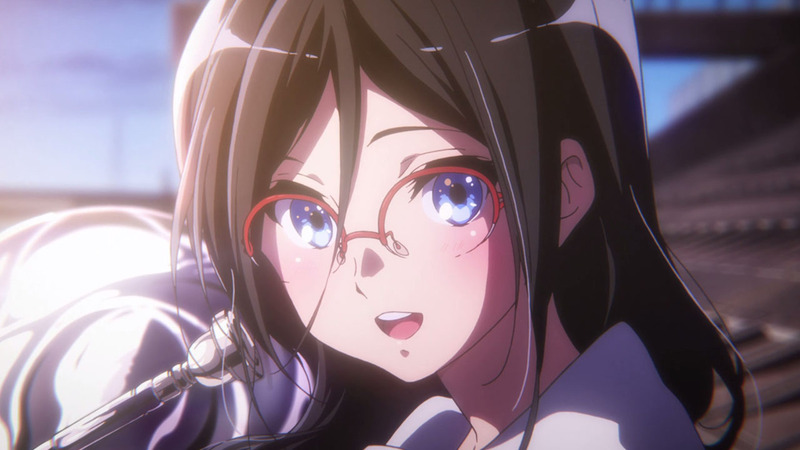 If Eupho is adapted by anyone else without the supervision of Yamada, I can imagine it being something else entirely different. Something not to my liking. Maybe other people who are more interested in the “serious cinematographic” whatevers. But a series that has a following with middle school girls interested in band probably doesn’t need that crap. It has never been a series for “otaku audiences” but everyone. The fact Kumiko’s narratorial voice is in the mode of subsequent narration informs us that it comes from a point in time chronologically distant to the moment being witnessed by the camera. The alternative is Kumiko present-tense thought-speech, which /is/ introspective in the current. I never complained about flashbacks: rather, than Kumiko’s ‘telling’ just says what they already say themselves. This wasn’t how things worked in season one: the style of adaptation there let Takeda’s drama speak for itself, and not be spoken for by its protagonist. What Hibike!’s first season showed was a real attention to the potential for cinematography in bringing this narrative to life. The way Kumiko’s narration is adapted in the second season has only been a step back for me – it’s never brought anything forward. And a sincere appraoch to cinematography should never be regarded as ‘crap’. The more you understand about cinematic narratives, the more you appreciate how even the simplest, dorkiest shows and stories need a lot of control and attention to detail to make them shine. It’s not about flashiness – it’s about competency of co-ordination between purpose and design. But as I stress, Kumiko’s narrative voice is my one problem with the adaptation. /Everything/ else fits so well together, and it’s great to hear that some of these scenes are anime-original. It’s just jarring that Kumiko has grown this voice now, at a time when she’s less personally involved in the narrative than before. The metaphors may work better for you because with your familiarity with the source material, immersion wavers in a different way to that of an anime-only watcher. Visual signifiers have another layer of performance, that of recollection and co-ordination with the intertext of the original. This can make verbosity feel more comfortable: but without a familiarity with that intertext, it doesn’t work for me. There are all sorts of ways to simply capture what ‘ice wrapped in a blanket’ means without saying those words over the scene: all sorts of ways to not mix ‘an abtraction with the concrete’, as Ezra Pound would warn against. KyoAni’s cinematography has always struck me as approaching poetry more than prose: it has that hazy, transient sense of feeling over fact. But Kumiko has repeatedly ruined that effect for me, by delivering the poetry in diegesis, in a prosaic tone that offers none of what free indirect style can share with us as active readers. There’s a line between ‘cheesy’ writing and mere journeyman writing. If Hibike! is a cheese, for me it’s the kind you can buy at a supermarket that betrays more flavors than you can expect. A commodity that has rare beauty hidden beneath its initial impression. The first season of Hibike! /was/ that cheese for me; the adaptation was rife with subtlety beneath layers of gaiety. The second season has lost that dynamic, and that’s been my honest experience with the story, and I can’t seem to put it down to anything other than this development in narrative style.